In today's "Healthwatch," smoking Smarties - is this trend just eye candy or a health risk to your child? It's a fad growing at schools across the country. Due in large part to its popularity on video sites like YouTube. 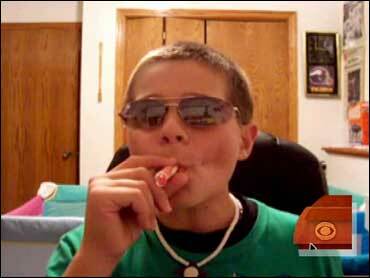 Smoking Smarties gives children the appearance of a smoker's exhale. The videos posted on YouTube even provide viewers with a how-to. With this fad come health risks. And because of them, some school administrators are taking action. In an e-mail to parents, Phyllis Faust, Interim Principal at Hewitt-Trussville Middle School in Trussville, Ala., wrote: "Due to the potential danger, I have made it clear to our students that possession of Smarties (or similar candy) will result in a Class II offense." A Class II offense at Hewitt-Trussville Middle School means detention. Pediatrician Dr. Lisa Thornton sat down with Early Show co-anchor Maggie Rodriguez to discuss the health risks associated with this disturbing fad. "If you look at the behaviors this is promoting, it's promoting this pre-smoking behavior. There's this whole ritual around how these kids do this, and it looks like smoking. So I'm concerned that the next step is smoking," Thornton said. Thornton demonstrated how the "Smoking Smarties" are made. The Smarties are crushed up and opened on one end, and then partially opened on the other end like a cigarette. Then they puff the sugar into their mouth and then let it come out, which looks like they are smoking. "Could that harm them physically?" Rodriguez asked. "Well, that can't, but what some of them do, and you'll see this on some videos, they actually inhale it like a cigarette, and that puts sugar in your lungs, and you'll cough because that's what your lungs do as they try to clear out anything foreign that gets in there, but yeah, you shouldn't be inhaling sugar into your lungs. But the health risk of sugar is the least of their problems," Thornton said. Thornton, who has three children, ages 17, 10 and 8, suggests talking to your kids at an early age - as young as 6, 7, 8. "You can start talking about it. And when you're somewhere and kids smell the smoke, they'll notice that it's irritating and they don't like it. And you can discuss that that's something that we don't do, that's very dangerous. My kids are all very tuned into this. They know that this is a big health risk. So, I hope that kids don't start doing this and then making it a cigarette instead," Thornton said.